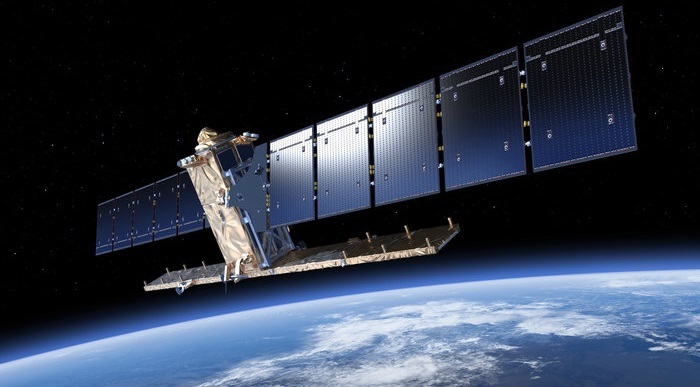 The Sentinel Satellite Fleet is part of the Copernicus program – the European Commission’s Earth Observation Program formerly known as GMES (Global Monitoring for Environment and Security). 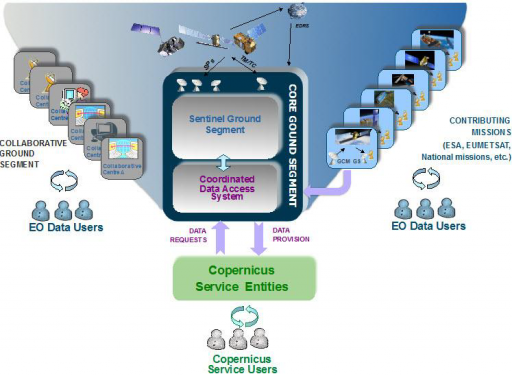 Copernicus aims to achieve an autonomous and operational Earth observation capacity. The program uses data provided by environmental satellites, and air & ground stations to provide a comprehensive set of land, atmospheric and oceanographic parameters in support of environment and security policy needs. Copernicus will be supporting six main branches of monitoring – land, ocean, emergency response, atmosphere, security and climate change. For that, the program relies on its space segment of observations satellites, and in-situ measurements using ground-based and airborne sensors. Data produced by Copernicus will be used by policy-makers. The GMES program was initiated in 1998 by the European Commission and the GMES partnership between member states, space agencies and industry representatives was formed in 2001. The GMES Bureau was set up within the EU, Brussels, in 2006 and the GMES Fast Track Services and Pilot Projects were inaugurated in 2008 including Marine monitoring, Land monitoring, Atmosphere monitoring, Emergency response and Security. The European Space Policy recognized GMES as a European flagship mission next to the Galileo Navigation System – allowing in depth-studies for the space segment to commence. For the initial phase of GMES, space-based data from current missions of ESA, EUMETSAT, and those of the ESA/EUMETSAT member states was used. To ensure the long-term sustainability of the operational program, GMES will establish its own dedicated space segment consisting of several satellites with different monitoring payloads. The project will become a part of the Global Earth Observation System of Systems for which it will provide data products and also have access to GEOSS data products. In 2012, GMES was re-named Copernicus by the European Commission to honor the great European scientist and observer, Nicolaus Copernicus. Deployment of the Copernicus satellite constellation is expected to begin in 2014 using different launch vehicles including the Soyuz and Vega rockets operated by Arianespace. The Sentinel-1 mission is a European Radar Observatory mission designed and developed by ESA for operation by the European Commission under the Copernicus program. 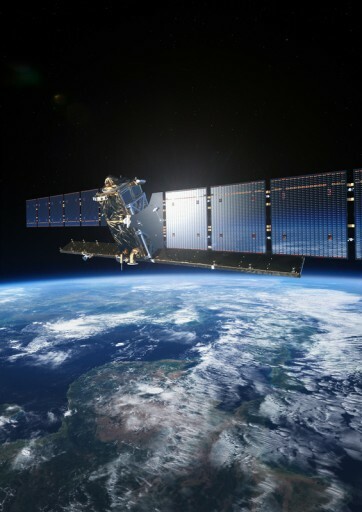 Sentinel-1 will provide continuity of C-Band Synthetic Aperture Radar data for operational applications across Europe and to contribute to the GEOSS (Global Earth Observation System of Systems). The mission builds on ESA’s ERS and Envisat SAR instruments to ensure high-data quality by maintaining key instrument characteristics and ensuring well-calibrated data products. 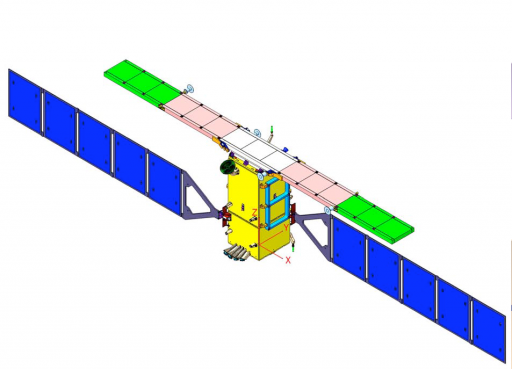 Sentinel-1 includes two satellites in a Sun Synchronous Orbit. The Sentinel-1 spacecraft will provide operational data products to Copernicus Ocean, Land and Emergency as well as to national user services. This data includes the observation of the maritime environment (sea-ice monitoring, oil-spill detection, surveillance of maritime transport zones) and land observations (vegetation monitoring, surface mapping, support of crisis – natural disasters like flooding and earthquakes), and humanitarian aid. The Sentinel-1 satellites will operate at a high-revisit time that will allow the generation of SAR interferometry coherent change detection application to monitor surface deformations and cryosphere dynamics. The Sentinel-1 satellites are built by Thales Alenia Space, Italia with the contract for the first spacecraft awarded in 2007 and the second in 2010. The SAR payloads for the two identical satellites are being built by Astrium (Airbus Space and Defence). Sentinel 1-A and 1-B are based on Thales’ PRIMA satellite bus that provides a stable platform for the SAR payload with respect to pointing accuracy, platform stability and support systems such as thermal control, power supply and data transfer. PRIMA first flew in 2007 aboard the COSMO 1 spacecraft with three more COSMOs following until 2010. The bus was also employed for the Radarsat-2 spacecraft launched in 2007 and has demonstrated its performance in flight. Overall, the Sentinel-1 bus measures 2.8 by 2.5 by 4 meters with two 10-meter long solar arrays and a 12-meter long SAR antenna. The spacecraft has a launch mass of 2,300 Kilograms including 130 Kilograms of propellant. The bus structure is box-shaped and uses aluminum sandwich structure for its external panels and a series of internal panels that are attached to a Carbon Fiber Reinforced Plastic structure. These panels accommodate the various satellite systems. 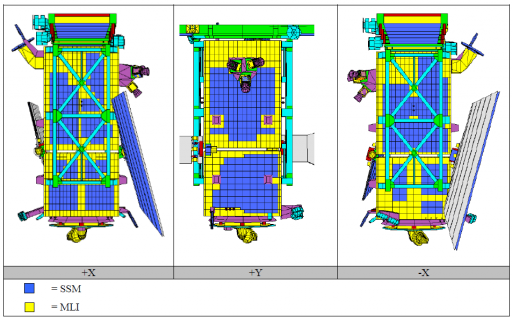 Sentinel-1 follows a modular approach – the payload systems are installed on the dedicated structure allowing it and the satellite platform to be built separately before the integration of the spacecraft. The satellite platform provides thermal control, attitude determination and control, propulsion capability, power supply, data handling and communications capabilities. The Service Module is integrated into the cone section interfacing the satellite with the launch vehicle adapter while the Payload Module is mounted on the Service Module allowing the allocation of payload units & appendages through four lateral panels and the upper deck of the satellite. Sentinel-1 uses two large solar array wings to generate electrical power. Each array consists of five panels that use Gallium-Arsenide triple junction solar cells to generate a total power of 4,800 Watts. The arrays are joined by spring-loaded hinges that deploy the panels once in orbit. Each array has its own Solar Array Drive Mechanism that rotates the arrays by +/-32° to face the sun whenever possible. The drive assemblies are controlled by the spacecraft controller based on Sun Sensor Data. The Power Conditioning Unit controls the state of charge of a single Li-Ion battery with capacity of 324 Amp-hours. The unit also regulates the spacecraft power bus and distributes power to the Power Protection and Distribution Unit (PPDU) and the C-Band Antenna Power Supply. The 3.2-Kilogram PCDU regulates the 28-Volt main bus of the spacecraft and also provides grounding, bonding & protection for the electrical systems of the spacecraft using CERMET type fuses. The PCU also supplies power to spacecraft heaters and pyrotechnic systems. Telemetry and Command of the Electrical Power System is accomplished via the Spacecraft Management Unit. Overall, the solar arrays deliver 4,400 Watts of end-of-life power. 1300W is dispatched to the PPDU for direct distribution while 2900W are transferred to the Battery and C-Band Antenna Power Supply, 2000W are used for battery charging (on average). 200W are required to power spacecraft heaters. The C-Band Antenna Power Supply provides an unregulated 65-Volt bus to the radar antenna tiles and two 28-Volt buses, one switched & one non-switched, to the payload electronics and the antenna electronics. Payload heaters are powered via an independent 38V power bus. CAPS delivers up to 4200 Watts of power to the Tile Power Supply Units during peak operations. Synch lines are provided for the C-SAR antenna and payload electronics. The CAPS assembly weighs 56 kilograms. Sentinel-1 is equipped with a monopropellant propulsion system consisting of 14 thrusters. The thrusters are installed in four locations on the spacecraft facing the different vehicle axes to serve as Reaction Control System. Six of the 14 thrusters are facing the same direction to be able to perform delta-v burns for orbit control. The Propulsion System uses a large propellant tank that is installed in the center of the satellite to maintain the vehicle’s Center of Gravity once the propellant is expended. The tank can hold up to 154 Kilograms of Hydrazine and is pressurized with gaseous Helium. An elastomeric diaphragm insures that the propellant is supplied to the engine without any gas bubbles. Between the tank and the thruster banks is the main pressure transducer and a latch valve. Each of the 1-Newton thrusters has two valves using dual-series seats and dual coils. The thrusters generate thrust by the catalytic decomposition of hydrazine propellant using heated platinum/palladium catalyst beds. 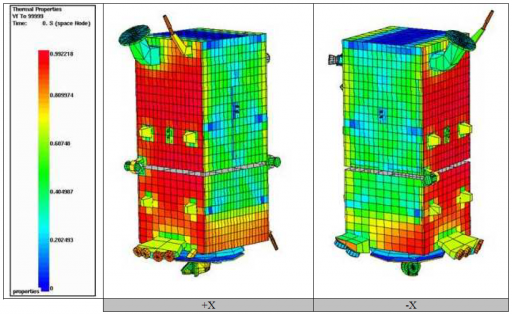 Each thruster uses a redundant catalyst bed heater. The propulsion is operated in blowdown mode starting at a tank pressure of approximately 24 bars. The thrusters can tolerate supply pressures of 5.5 to 23 bars to generate a thrust of 0.36 to 1.45 Newtons. The corresponding specific impulses are 205 seconds at the lowest supply pressure and 221 seconds at the highest pressure. Each thruster assembly weighs about 0.23 Kilograms and can be operated in steady-state mode and pulse mode for attitude control. 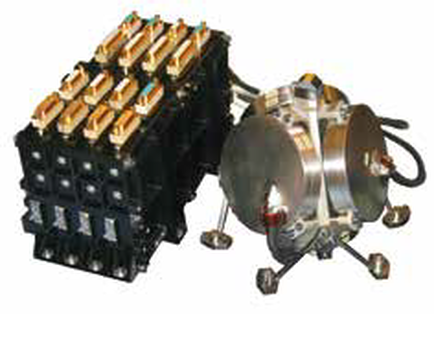 In addition to the thrusters, Sentinel-1 uses a reaction wheel assembly comprised of four wheels as well as three magnetic torquers for attitude control. The RWA consists of four wheels to achieve three-axis control with built-in redundancy. One Wheel Drive Electronics Box that has one dedicated channel for each wheel controls the RWA. The reaction wheel assembly is a rotating inertial mass that is driven by a brushless DC motor that spins the wheel. When accelerating the wheel, the satellite body to which the wheels are directly attached will rotate to the opposite direction as a result of the introduced counter torque. The magnetic torquers are used to counter the resultant force when de-spinning the reaction wheels as part of regular momentum dumps. The RWA has an angular momentum range of +/- 30Nms with an output capability of +/-0.1Nm. To acquire precise three-axis attitude data, Sentinel-1 relies on a suite of sensors including star trackers, fine sun sensors, magnetometers and a fine gyroscope. Data from these sensors is processed by the integrated Flight Control Platform that handles all tasks required to manage the spacecraft and all of its functions including attitude determination and control. 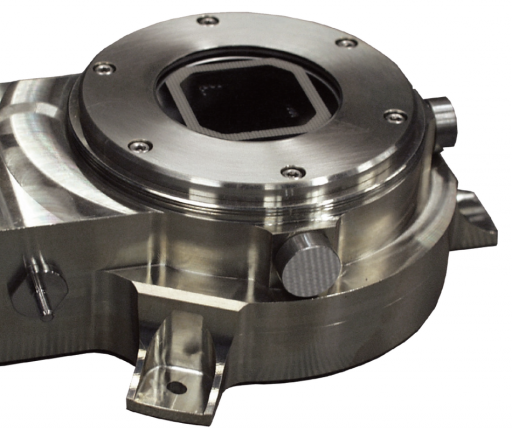 Overall, the system achieves an accurate attitude knowledge better than 0.003° on each axis. Pointing accuracy is better than 0.01° for all axes. Three wide-angle star trackers are used to acquire imagery of the sky that is analyzed by a software algorithm that compares the acquired star pattern with a catalog to precisely determine the spacecraft’s orientation in space. Sentinel’s star trackers consist of an optical head and an electronics unit that transfers star tracker data to the spacecraft controller using the 1553 data bus. In addition to the Star Trackers, Sentinel-1 uses a Fine Sun Sensor that provides data on the sun’s current position to allow a basic attitude calculation relative to the sun. This feature can be used during spacecraft safe modes to keep the solar arrays pointing to the sun for power generation. The FSS is 16 by 14.5 by 5.6 centimeters in size and weighs less than 650 grams. It includes a photodiode array with eight pixels that are illuminated by sunlight that enters the sensor via a slitmask. The angle of incident sunlight can be precisely calculated as it corresponds to the illumination of the individual diodes. The calculation algorithm uses the arctan -function of geometrical parameters and currents measured by the photodiodes. The FSS consists of two 128-degree Field of View channels and each channel has two photodiode arrays for built-in redundancy. Each channel also includes dark current diodes and sun presence diodes for data verification. 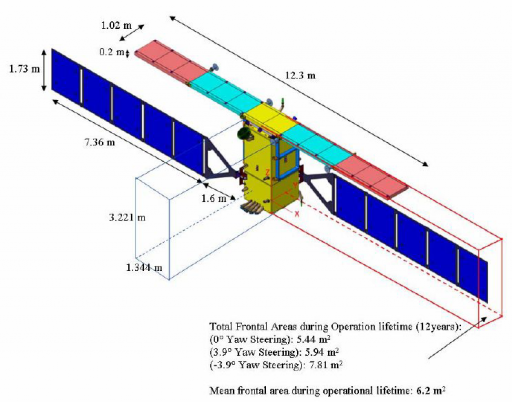 The ASTRIX 120 fiber optic inertial measurement unit of the Sentinel-1 spacecraft accurately measures changes in rotational attitude on all three axes to provide accurate attitude and rate data to the spacecraft control system. It consists of four independent inertial rotation sensors and a Gyro Electrical Unit that is comprised of four independent slices – one for each channel as part of a robust design. The system weighs 6.7 Kilograms and its Inertial Core Unit measures 215 by 180 millimeters while the electronics box is 270 by 150 by 145 millimeters in size. The system delivers accurate high-resolution data at high stability and low noise from low to high frequencies. The system incorporates auto fault detection and is built to operate more than 15 years being able to tolerate a total radiation dose of 50krad. It uses the 1553 spacecraft data bus to relay its readings to the onboard computer. 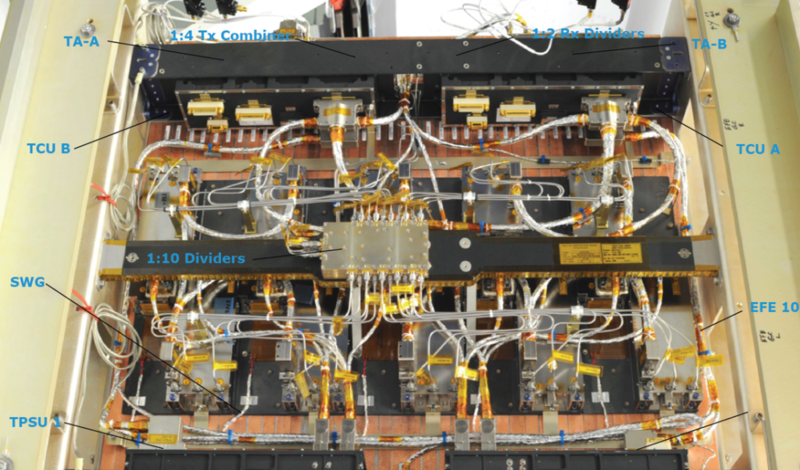 Two dual-channel GPS units are also part of the avionics system that use the L-Band frequency to receive signals from the GPS constellation spacecraft for accurate position determination and to provide time solutions for data tagging with timing and location. Each sensor uses a patch excited cup antenna with optimized multi-path performance measuring 200mm in diameter and 87mm in height. The antenna is attached to a 2.8 Kilogram electronics box (300x240x104mm). Processing the L1 and L2 signals of up to eight GPS satellites, the system can provide position measurements in orbit with an accuracy of about 3 meters and determine the spacecraft velocity with an accuracy of 3mm/s. Timing accuracy is better than 50 nanoseconds. Data collected by the sensor (tracking state, carrier to noise, amplitude measurements, noise data, satellite in view status and satellite navigation messages) are transferred to the spacecraft via the 1553 data bus. The heart of the Sentinel-1 Avionics System is the Spacecraft Management Unit that is responsible for the control of all systems of the satellite. It receives, processes and executes commands received via the satellite’s communications system and actuates the various satellite systems. The system also processes telemetry data for downlink, autonomously monitors the satellite’s health and conditions the instrument data for downlink. It is in charge of thermal control management, motor drive management, power distribution control, and command distribution. The system uses full internal redundancy and is equipped with a 32-bit SPARC V7 single chip microprocessor that uses 8Mbyte of Static-RAM, 8MByte of EEPROM, 64Kbyte boot-up PROM, internal high speed serial links, two 1553 interfaces, one analog RS-422 interface, and 14 ports for SpaceWire payload data connection. 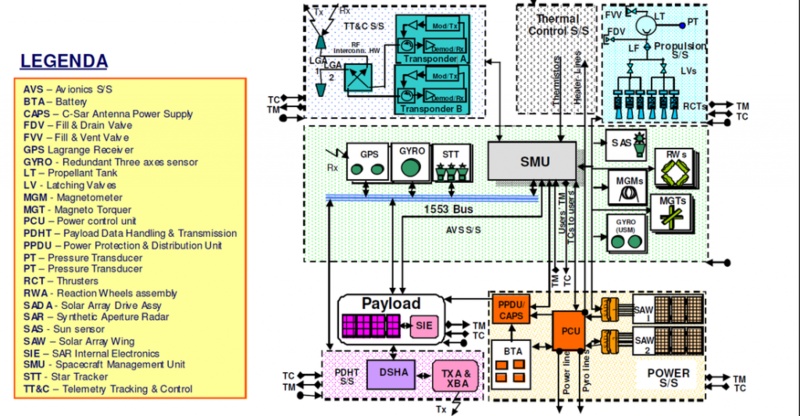 The SMU achieves 14 MIPS (Million Instructions per Second). The unit measures 350 by 324 by 280 millimeters and weighs 14 Kilograms. Sentinel-1 uses a combination of active and passive thermal control. Passive thermal control is accomplished by using multilayer insulation (MLI) covers and MLI tents to protect all components that reside inside and outside the spacecraft body. A number of heaters are directly attached to the spacecraft components such as avionics boxes, propellant tanks, thruster valves and motor assemblies. 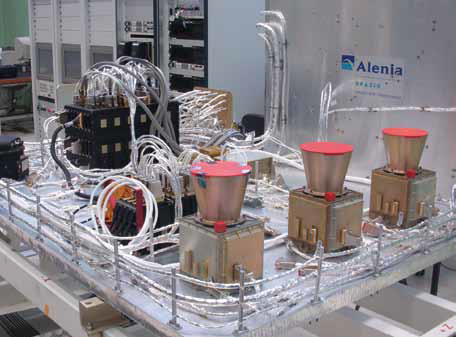 Several thermistors provide temperature readings to the command system of the spacecraft in order to activate or deactivate the heaters. Commanding is provided by the SMU based on fixed thermal setpoints that can be reprogrammed in flight. The Sentinel-1 satellites flies in a fixed attitude relative to the sun, only exposing its -Y side to direct sunlight. 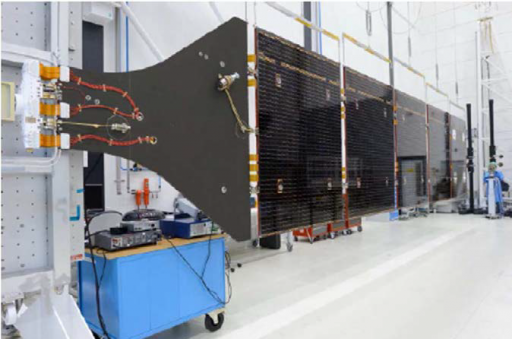 Therefore, most internal equipment is installed on the velocity, anti-velocity and anti-sun panels of the satellite’s interior to provide a more stable thermal environment. These panels also accommodate a number of radiators to dissipate excess heat generated by the electronics. Heat from internal equipment that is installed on the internal panels have thermal fillers underneath the baseplates. The heat is transported via doublers or heat pipes of different shapes to reach the radiators. On average, the satellite has to dissipate 271 Watts of thermal energy with peaks at 1kW. 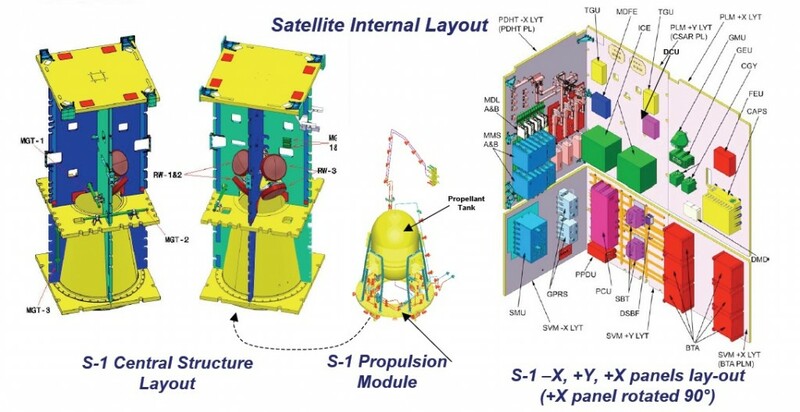 The Communications System of the Sentinel-1 satellite consists of two main components, the TXA (Telemetry X-band transmission Assembly) and XBAA (X-Band Antenna Assembly). These systems interface directly with the Data Storage & Handling Assembly that receives the payload and spacecraft data, processes it for storage, conditions it for downlink and transmits it to the comm system. 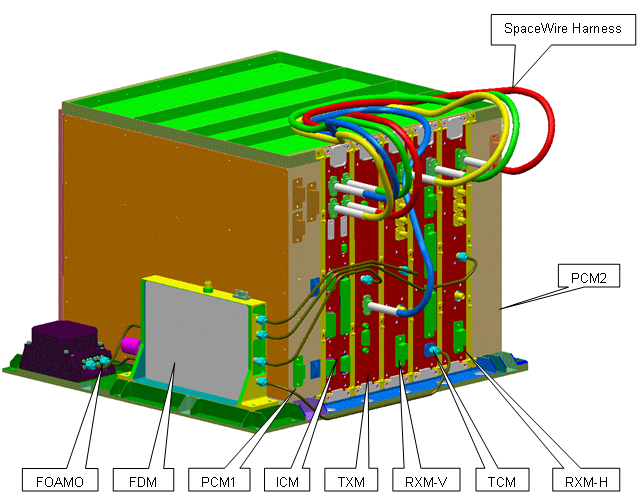 Overall, Sentinel-1 is equipped with more than 1400Gbit of mass memory (SD-RAM based cubes). The Data Storage & Handling Assembly achieves an overall throughput of about 1950 Mbit/s, with a payload input data rate of 2 x 640 Mbit/s for multi-polarization acquisition or 1 x 1280 Mbit/s for single-polarization acquisition. 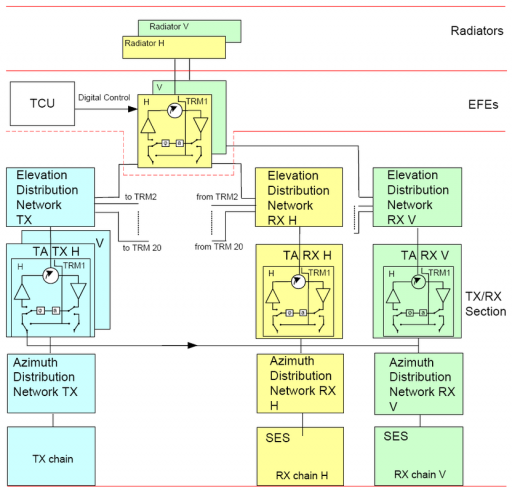 The Communication System operates in X-Band at a carrier frequency of 8180MHz. The TXA is responsible for encoding, modulation, up-conversion, amplification and filtering of the signal that is then transmitted via an isoflux, wide coverage antenna that is included in the XBAA. The Traveling Wave Tube Amplifiers that feed the X-Band antenna reach up to 60 Watts of RF power. The antenna’s isoflux zone is +/-64 degrees to allow a link establishment with ground stations starting at a ground antenna elevation of 5 degrees to maximize pass length and data volume. The communications system uses AES (Advanced Encryption Standard) Encryption and the O-QPSK modulation scheme. Two independent X-Band links are supported by the system – each with an output power of 16dbW and a bandwidth of 280 MHz achieving data rates of up to 300 Mbit/s per channel. Building a redundant system, each channel uses cold redundancy to increase the failure tolerance of the communications system. Telemetry & Command Up/Downlink is accomplished in S-Band at a data rate of 4kbit/s for uplink and downlink is programmable to 16, 128 or 512 kbit/s. Uplink messages to the spacecraft include a Logical Authentication Counter and a Message Authentication Code to protect the spacecraft from unauthorized access. In addition to its radio communications system, Sentinel-1 carries a Laser Communications Terminal to use the European Data Relay System EDRS that consists of laser terminals deployed in Geostationary Orbit aboard Communications Satellites. The LEO-GEO communications link can achieve high data rates and the Geostationary Satellite will use a Ka-Band link to a ground station to relay the data to the ground. The Laser Communications Terminal consists of a 2.2-Watt laser and a telescope with a 135-millimeter aperture to be able to transmit information over a distance of more than 45,000 Kilometers. The laser operates at a wavelength of 1064 nanometers and modulates the data onto the laser beam using Binary-Phase Shift Keying BPSK. The LCT weighs about 50 Kilograms and measures 0.6 by 0.6 by 0.7 meters. The laser communications link between the LEO Satellite and the terminal on the Geostationary Spacecraft reaches a data rate of 1.8Gbit/s. The Ka-Band link from GEO to the ground station reaches 600Mbit/s. A direct LEO-to-Ground downlink is also possible and could reach data rates of up to 5.6Gbit/s. 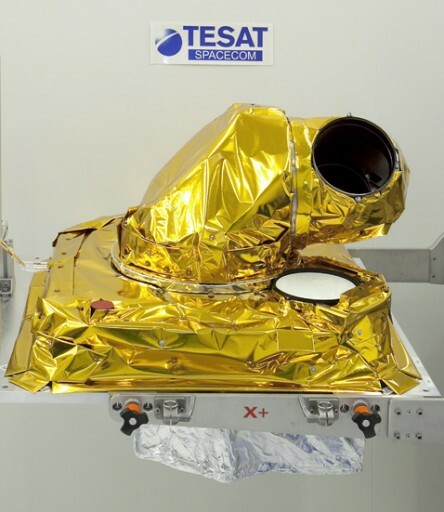 The C-Band Synthetic Aperture Radar, or C-SAR, installed on Sentinel-1 has been designed by EADS Astrium to provide all-weather imaging to produce high-resolution data required for Copernicus services. The SAR Antenna Subsystem is an active phased array antenna with Transmit and Receive gain and phase control. It consists of 14 identical tiles arranged in five deployable panels – a central panel is installed on the top side of the spacecraft (two tiles), and two deployable side wings, each with three tiles, are mounted on either side of the spacecraft. Overall, the antenna is 13.3 by 0.82 meters in size and weighs 880 Kilograms. The entire C-SAR payload including electronics weighs 945 Kilograms. The antenna is equipped with 280 phase centers organized in 20 rows and 14 columns. 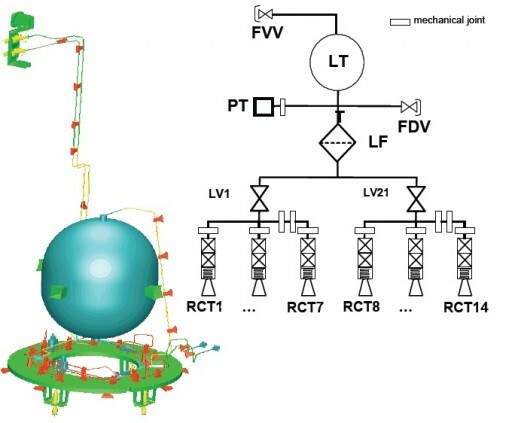 The SAR system operates at a center frequency of 5,405 GHz and bandwidths from 0 to 100 MHZ. 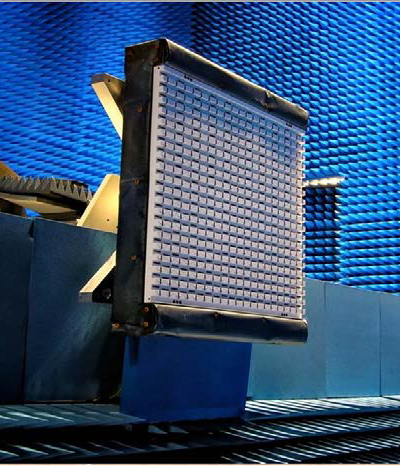 The radar pulse width is programmable between 5 and 100 microseconds. The antenna’s slotted waveguide radiators are capable of operating in dual polarization mode and the antenna has a peak power consumption of 4,368 Watts. C-SAR operates at a pulse repetition frequency of 1000 to 3000 Hz and a sampling rate of 300 Mhz. The SAR antenna includes Transmit Receive Modules in its Front End Electronics that provide Tx and Rx gain and phase control. 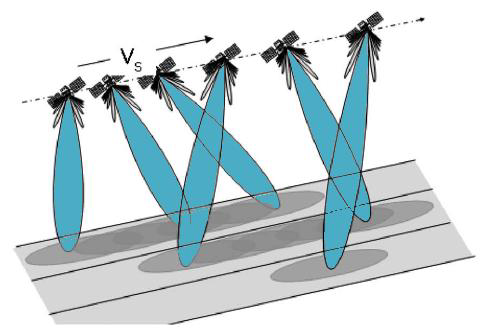 The systems can support rapid beam steering, beam shaping and polarization selection – it is a dual-polarized antenna that can transmit in a selected polarization and receive in both polarizations simultaneously. C-SAR creates its radar signal at baseband in the chirp generator that is then up-converted to C-Band and distributed to the High-Power Amplifiers that reside in the Front End Electronics. Signal transmission and echo reception is realized with the same antenna using slotted waveguide radiators. In receiving mode, the weak echo signal is amplified by Low Noise Amplifiers in the Front End Electronics and summed up using the same network as the transmit system. After filtering, the receive signal is digitized, formatted and recorded. 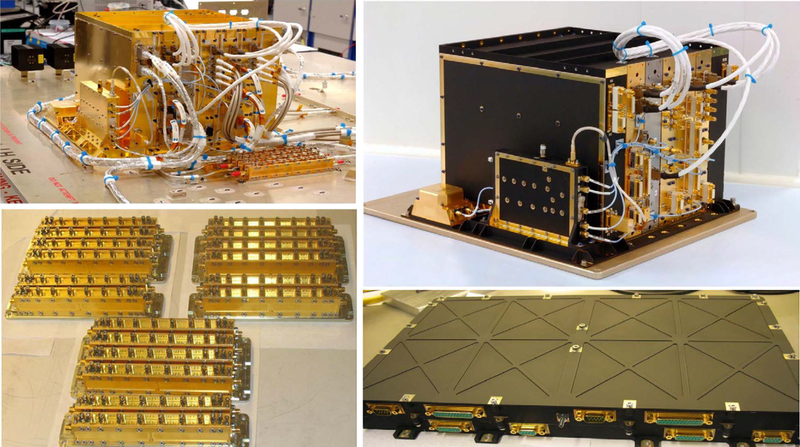 Each antenna tile consists of ten Waveguide-4 assemblies each with two vertically and two horizontally polarized waveguides and associated electronics: 40 Transmit/Receive Module, 2 Tile Controller Units and 2 Power Supply Units. A single antenna tile is 0.87 by 0.87 meters in size and is capable of signal transmission and reception, transmit signal high-power amplification, low-noise amplification of the receive signal, distribution of the signal, phase and amplitude control, and internal calibration. The tiles are structurally supported by a Carbon Fiber Reinforced Plastic structure that makes up the waveguide radiator and stiffeners. All electronics are placed on the rear of the radiators such as the Front End Electronics or inside the cross stiffeners (Tile Control Unit & Power Supplies). The size and low-losses of the CFRP waveguides and the high-performance of the electronics allows the instrument to operate at a high sensitivity and achieve the two-dimensional distributed target ambiguity of -22dB. 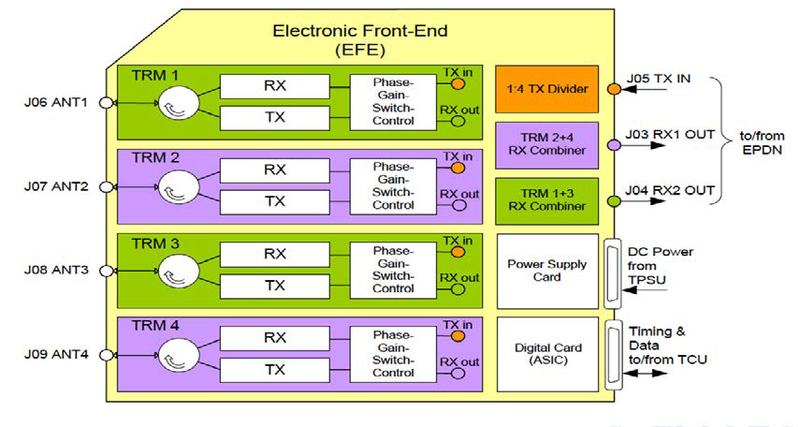 Each Front End Electronics Assembly consists of a digital card, a Power Supply, an RF Distribution unit and the Transmit/Receive Module. The Front End Electronics are provided with Transmit Signal Pulses via the Elevation Plane Distribution Network and transmit the Tx pulses in the selected polarization, either horizontal or vertical to the corresponding radiator elements. The Front End Electronics are also responsible for receiving the echoes from the two horizontal and vertical radiator elements independently and simultaneously. In addition, the Front End Electronics are in control of the phase setting in transmit and the control phase and gain setting in receiving mode. Control of the Front End Electronics is provided by the Tile Control Units that implement cold redundancy. The DC-power supply of the antenna also employs a fault-tolerant design as its includes a total of 28 units – two per tile which allows the instrument to continue to function in the event of a failure of a certain number of power supply units. The link between the satellite and the SAR antenna is the SAR Electronics Subsystem SES that conditions the Transmit Pulses and processes the received signals. It links the instrument to the platform’s computer and command and control systems and to the Payload Data Handling & Transmission. SES includes a channelized modular design in its transmit and receive chains to be able to handle the generation and reception of wide-band signals in multi-polarization mode using two Receive Channels. The system is fully redundant and provides radar command and control, timing control, transmit chirp generation, frequency generation, up&down-conversions, modulation & demodulation, data filtering, compression and formatting as well as transmission to the mass memory. The heart of the SES is the 21-Kilogram Integrated Central Electronics Unit (ICE) that provides the radar with its core functionality, control and monitoring. It generates the C-band chirped radar signal and samples the echo signal at an IF close to baseband using a digital receiver. ICE uses single up-conversion and down-conversion stages and a data processing system that ensures efficient digital filtering and data compression. The ICE uses a modular design with its different cards and modules integrated by a backplane wiring loom to allow for mechanical flexibility. 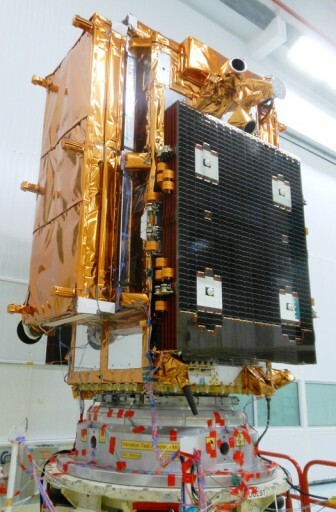 Residing within the ICE is the Instrument Control Module which houses a Leon II Processor and PROM for boot software and EEPROM for the application software and the tables of the radar characterization database. The Transmit Module uses a direct digital synthesis chirp generation system at 150 MHz. The signals are then converted in a single stage to the instrument’s center frequency at 5.405 GHz that is provided by the radar. Another amplification stage provided by the Transmit Gain Unit allows the radar to be delivered a fully programmable chirp transmission chain. 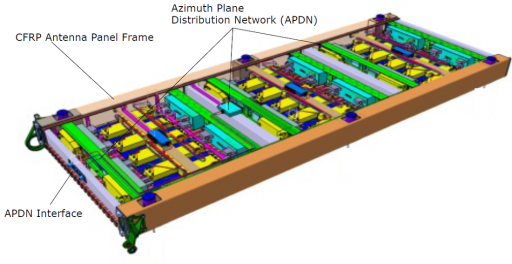 The Receiving infrastructure is comprised of two matched receive modules within the ICE to accomplish independent and simultaneous reception of vertically and horizontally polarized signals. Signals from the radar are filtered by a Mission Dependent Filter Equipment before reaching the receive modules where the signals are down-converted to 75MHz before being digitized, compressed and packetized. The output is relayed to the mass memory at 640Mbit/s. A Timing Control Module provides precise timing control needed for the FPGA logic to provide the necessary timing waveforms required to define and control the pulse timing & precise timing relationships of all the required timing signals used by the instrument. A Frequency Distribution Module and Ultra Stable Clock generate the timing references used by all signal modules. Three Power Control Modules house DC/DC converters that power the different electronics. 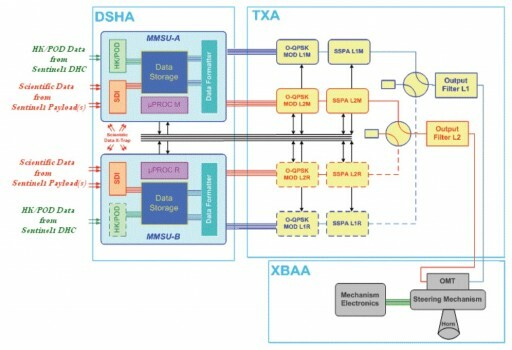 The SAR instrument can be operated in four different modes to satisfy the Copernicus requirements for data products and for continuity and emerging user requirements. 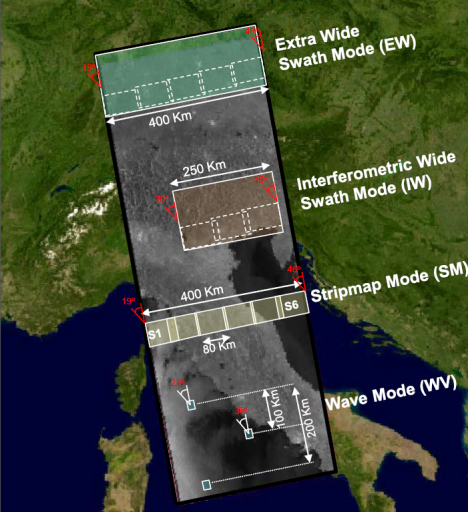 These modes include the operational Wave Mode, and Interferometric Wide-Swath Mode which includes a new approach to SAR scan methods known as Terrain Observation with Progressive Scan. The other two scanning modes are Strip-Map Scan and an Extra Wide-Swath Mode. 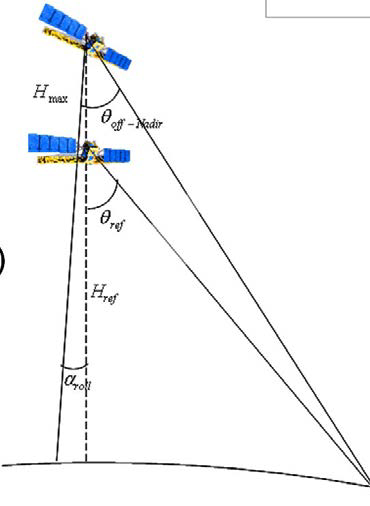 For each swath, the antenna has to be configured to generate a beam with fixed azimuth and elevation pointing. For all modes, C-SAR achieves a Radiometric accuracy of 1dB and a Distributed Target Ambiguity Ratio of -22dB. The Wave Mode scanning method is characterized by a low data rate as it samples images of 20 by 20 Kilometers at 100-Kilometer intervals along the orbit of the spacecraft. The images have a ground range resolution of 5 meters and an azimuth resolution of 20 meters. For this method, the SAR is operated at mid-incidence angles at 23 to 37 degrees. The Wave Mode scan is the only single-polarization method used by Sentinel-1 – it can select between vertical and horizontal polarizations. The Strip-Mode uses dual polarizations – either vertical or horizontal for transmitting and a combination of the two for receiving. In Strip Mode, the radar covers a ground swath of 80 Kilometers providing imagery at a ground range resolution of 5 meters and an azimuth resolution of 5 meters. For SM, the radar operates at incidence angles of 20 to 47 degrees. The Extra-Wide-Swath Mode covers a ground swath of 410 Kilometers providing lower resolution imagery with a ground resolution of 30 meters and an azimuth resolution of 40 meters, also operating at incidence angles of 20 to 47 degrees and using dual-polarization scanning. The Interferometric Wide-Swath Mode covers a ground swath of 250 Kilometers and delivers imagery at a ground range resolution of 5 meters and an azimuth resolution of 20 meters. It is also operated in dual polarization mode and uses incidence angles of 31 to 46 degrees. 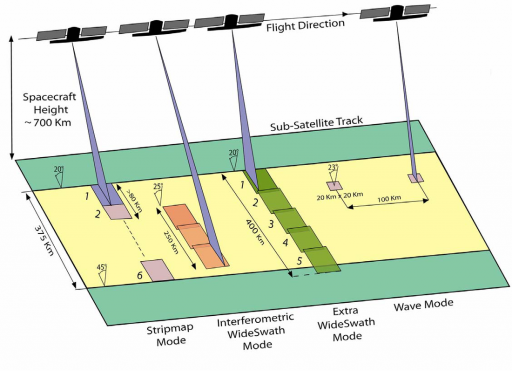 The Interferometric Wide-Swath Mode employs the new Terrain Observation with Progressive Scan, TOPS that is implemented by fast antenna beam steering in elevation, transmitting pulses towards a sub-swath with fast electronic azimuth scanning per subswath to harmonize the performance in the along-track direction and provide a combination of large swath widths and high resolution. Several sub-swaths are acquired quasi-simultaneously by switching from swath to swath in between radar bursts. Interferometry is ensured through overlap of the Doppler spectrum in the azimuth domain and the wavenumber spectrum in the elevation domain. TOPS can also be used for the Extra-Wide Swath Mode. 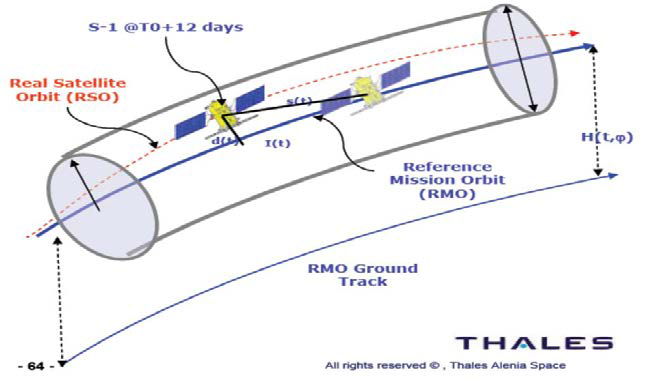 In nominal mission operations, the SAR payload is operated in any of the high-resolution modes for 25 minutes per orbit while the rest of the orbit is covered in Wave Mode. A continuous roll maneuver around the orbit is implemented to compensate for the altitude variation so that it allows the usage of a minimal number of different pulse repetition frequencies and sample window lengths per orbit. Normally, one pulse repetition frequency will be set and the update rate of the window size is kept below one in 2.5 minutes to simplify instrument operations. The roll steering angle has been set to 1.6 degrees per 27 Kilometers in altitude variation with a roll applied to the sensor attitude that depends on altitude and varies within -0.8 and 0.8 degrees. 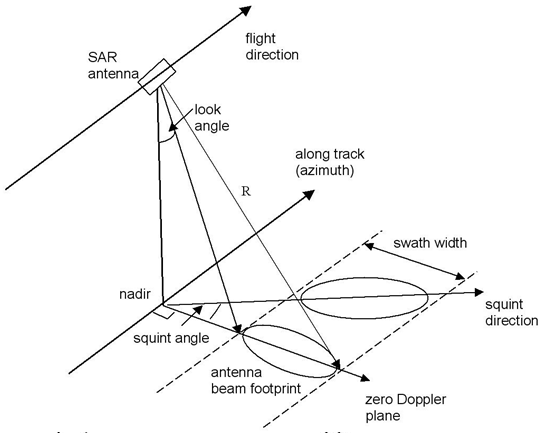 At the maximum orbital altitude, the SAR antenna off-nadir angle is 30.25° compared to 28.65 degrees at the minimum altitude of 693 Kilometers. Calibration of the SAR payload is accomplished using internal calibration utilizing internally generated calibrated signal sources to track the performance of the radar over time and compare it to pre-flight calibrations. External calibration uses ground targets of known properties to provide and end-to-end calibration of the system. Geometric calibration is required to assign SAR data to the corresponding locations on Earth taking into account delays caused by signal transfer and processing. This is accomplished using reference targets on the ground that are well surveyed allowing the calculation of the internal delay so that systematic azimuth shifts can be implemented. Additionally, Antenna Pointing Calibration is required to ensure exact beam pointing through measuring the antenna pattern across the rainforest and using ground receivers. The gain offset between different beams is determined by similar means. Finally, radiometric calibration is performed to correct any biases in the SAR data by determining the absolute calibration factor through observation of calibration/reference targets on the ground. The two Sentinel-1 spacecraft will fly in a Sun-synchronous near-circular dawn-dusk orbit at an altitude of 693 Kilometers and an inclination of 98.8 degrees. This creates a repeat cycle of 12 days (175 orbits) for each satellite. The A and B satellites will fly in an identical orbit phased by 180 degrees to allow the creation of SAR interferometry data at time intervals of six days. Orbit Control is an important aspect of the Sentinel-1 mission due to the sensitivity of SAR operations to altitude. Therefore the satellites will be kept in the narrow tube of 50-meter diameter around the precise reference orbit. Orbital control is achieved by applying across-track dead-band control at the most Northern-point and the Ascending Node crossing. Controlling the orbit at these two points allows the satellite to remain inside the narrow tube for the rest of its orbit. Orbit knowledge is provided by the dual-GPS receiver of the spacecraft with an accuracy of ten meters that is improved to an accuracy of 3 meters or better as part of ground-based data processing. The Sentinel satellite constellation requires a sophisticated ground segment to provide the operation of several satellites and ensure rapid data processing and distribution to users within the Copernicus program. The Sentinel Core Ground Segment is responsible for monitoring and controlling the Sentinel spacecraft, planning spacecraft activities such as calibration, maintenance and data acquisition as well as receiving, processing, distributing and archiving the payload data. The Core Ground Segment also manages collaborative ground segment institutes and coordinates with contributing missions of ESA, Eumetsat and international partners. 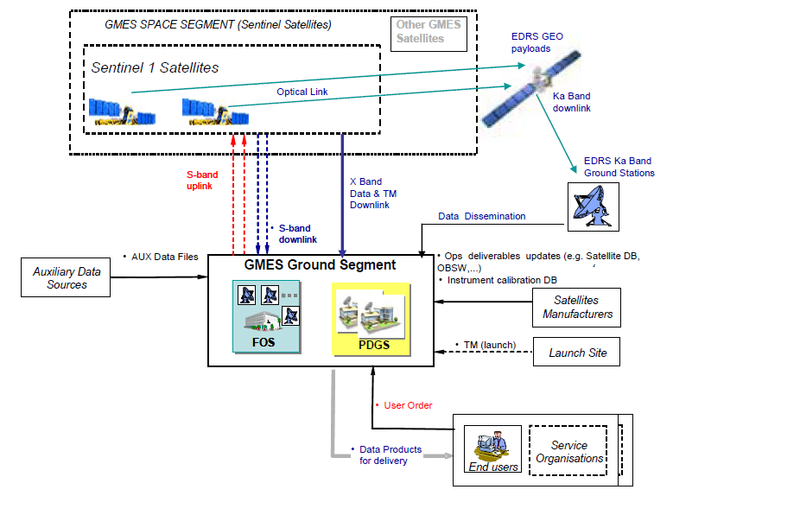 The Ground Segment Concept incorporates a Flight Operations System and Payload Data Ground Segment. 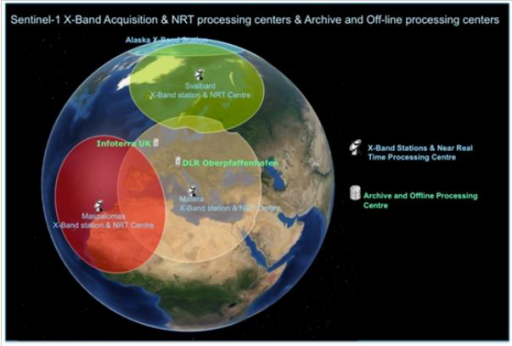 Data from the satellites is downlinked to X-Band receiving stations or via the European Data Relay System to ground terminals. Near-real time data products are generated directly at the receiving station within one to three hours after receipt. The acquired data is then transferred to Processing and Archiving Centers where base level products from all acquired data are generated and archived. The data is then transferred to Copernicus users. The Payload Data Management Center is in charge of following the entire data flow to ensure adequate processing times and that data quality is maintained by all processing stations. Products and performance of the Sentinel space segment is monitored by the Mission Performance Centers. Four X-Band receiving stations have been established in Norway, Alaska, Spain and Italy. The Sentinel-1 Processing and Archiving Center are operated by the German Aerospace Center in Oberpfaffenhofen and Astrium (Airbus D&S) in Farnborough, UK. The Mission Performance Center is located in Brest, France, the Payload Data Management Center operated by ESA is located at ESRIN and the Precise Orbit Determination service is provided by GMV, Spain. A single S-Band uplink station is used for command uplink approximately every four days as Sentinel-1 is designed to operate autonomously for 96 hours. Sentinel-1 creates about 90 GBytes of data per orbit and about 1.2 TB of data per day that has to be downlinked and processed to Level 0 products within three hours of acquisition. Level 1 data products are available within 24 hours in the form of Slant-Range Single-Look Complex Products & Ground Range Detected Geo-referenced Products. Level 2 products include Ocean wind field, swell wave spectra and surface current information. Data product resolutions will vary from 1.7 by 4.3 meters to 3.6 to 4.9 meters in Strip Mode, 2.7 by 22 to 3.5 by 22 meters in Interferometric Mode, 7.9 by 42 to 14.3 by 43 meters in Extra-Wide-Swath Mode, and 2.0 by 4.8 to 3.1 by 4.8 meters in Wave Form Mode.